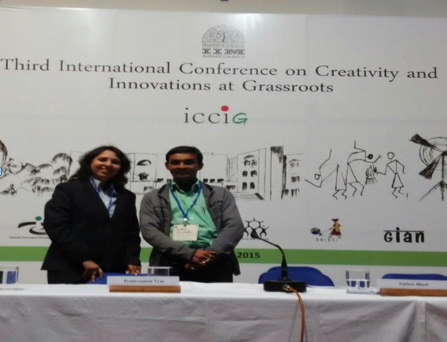 Jayaprakash Chowdury, a wastepicker in Delhi and now Secretary of Safai Sena, an army of cleaners, was invited to be a keynote speaker at the ongoing ICCIG3- the Third International Conference for Creativity and Innovation at the Grassroots, at IIM Ahmedabad. He spoke about innovations in waste through material recovery and creating livelihoods at the Material Recovery Facility being run by Chintan at the New Delhi railway station. This project in partnership with the Northern Railways and the informal recyling sector, the waste collectors and wastepickers, has not only effectively managed the waste being generated at the New Delhi Railway Station through recovery of recyclables like paper, glass, plastic etc through segregation and further also creating compost from the organic waste, in addition has also generated safe secure stable livelihoods for 75 wastepickers. This project at the New Delhi Railway station won Chintan and Safai Sena the prestigious Deutsche Bank Urban Age award recently. The work at the New Delhi Railway Station shows how not only can urban spaces be sustainable, inclusive and embracing of the poor, but in fact, the poor, such as the wastepickers, are germane to the safeguarding of the commons and making them more usable by all. About Chintan and Safai Sena: Chintan is a registered NGO that works on issues of solid waste, with a focus on creating safe, clean jobs for abjectly poor wastepickers, training them to supply essential waste management services to the city. Chintan partners with Safai Sena (an organization of waste pickers, itinerant buyers and small waste traders) to clean up cities, recycle more efficiently and create livelihoods for wastepickers. As a result, it is also able to help children picking trash to go to school, as families earn steadier incomes.